It is summer, and this is what our Christmas looks like. Christmas was a joyous affair; totally low key, just the way I like it to be. Having kids around at Xmas certainly make it alot of fun. If you are receiving this post via e-mail and/or cannot view or play the movie here it is on YouTube. It is lovely watching the cousins interacting now that they are both toddlers. My week leading up to Christmas has been, I don't know, somewhere between uneventful and significant - not sure which side of the pendulum I'm on, but I know that I'm happy to have two enticing weeks of family time stretching out before me. I'm in the middle of planning what we are going to be doing. A couple of weeks ago I requested an entire month off work over Xmas/NY period, and when Jef said he was taking 2 weeks off I realised maybe I should have confirmed with him first?!? Even though we live in the same household and keep roughly the same hours we don't seem to catch each other (at the right moment) to plan these things out. I tend to operate around assumptions and intentions, a fact I know about myself and am forever wanting to change. Anyway, I drew up a planner in MS Excel today, and on it are events such as spending Xmas day at Mum's, Boxing day at Dad's, going up to Whangarei to see Jef's Dad and Margaret and spending Kien's birthday up there, NY's day on the farm, back to work 9th Jan (I changed my leave request to match Jef's), 20th or 21st Jan flying to LA....oh, did I not tell anyone I was toying with the idea of going to LA for a couple of weeks? Yeah, it is impulsive - I e-mailed my dear friend in LA last week and asked how she felt about us crashing their pad in January. I'm also intending on asking my aunt if she can put us up for a few days too (hey, Co Ngo, will you have us stay a few days in Jan?). So yeah, I've been busy in my head, but not really too busy externally. We've also had a bit of a mish-mash on the weather front, and tonight in Auckland was no exception. But I didn't care - I had my heart set on getting a Thai chicken curry and picnicing at the park between Brown St and Richmond Rd. That's exactly what we did. Under the grey clouds that threatened rain we laid our blanket and enjoyed the meal. 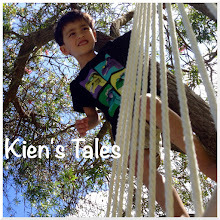 Kien (being Kien, and a toddler) was full of beans. He went on the swing, ran around, ate a few grains of rice, and ran around some more. He was out on the footpath saying "hi" and waving at people as they walked past. I really like this park a lot; it is like having an old English garden to frequent whenever we want. Kien saw a bee flying and tried to follow it. So he ran around looking for the bee, asking "where is the bee? ", "where did it go?". It's a thing he does at the moment. He'll be looking for something, ask "where did it go?" (and giving the same look as in the above pictures), and then he'll shrug and answer himself - "I don't know". It cracks me up every time. I just love his expression. Adding to the theme of old English charm, as we were walking down the road there was this beautiful gate enveloped with flowers. Kien likes to smell flowers. I've been reminiscing over photographs from the last couple of years, and that come the 29th of this month my child will be officially 2 years old. Wow, two years...where did it go? Little old NZ has one street that makes the news headlines every single year - Franklin Road. So of course we have to walk it every single year to admire the (more than likely peer pressured and obligatory) residential (mostly) properties adorned with Christmas lights. It happens that we live just down the road from this famous street, and so a couple of weekends ago we had the family over for dinner before braving the wind and rain to see some lights. Luckily when we set out it had stopped raining. What an amazing effort people go through. We were all thoroughly impressed with the car! It was pretty late (maybe 20:40ish) but Kien was still happy and full of cheer. Last year we actually woke him up and took him out especially to see the lights - I know! If it wasn't raining I'm sure there would have been carollers out there as in previous years. I've been meaning to go up there again but with all the rain this last week I'm pretty sure everyone stayed inside too. I didn't make it last year to Kien's daycare party, so I made an extra effort to make sure I attended last Friday. It was a dress-up affair, so I put him into an army outfit I found in the wardrobe (someone must have given it to us once upon a time, I can't think of why though, but I was thankful to have a dress-up outfit none the less). He looked so adorable with his little tie and braces. He didn't see me when I showed up at 10:30am, and I found him playing merily by himself at the table. There was a puppet show followed by a shared lunch, and it was so much fun watching all the kids participating and enjoying themselves. Kien had a very short attention span for the show, so to keep him amused we played with the camera. What can I say, the boy loves looking at himself, and I would show him after every photo taken. It keeped him entertained for almost 10 minutes. I couldn't stay for long because I had a work function to go to. I made the mistake of telling Kien I had to leave, and he started to cry. So I hung around another 5 minutes and had to sneak out. I don't know why I felt a little guilty doing that? Sometimes I catch myself staring at my child for a really long time, and when he realises I'm looking at him he could flash me the most amazing smile, or he might continue with what he is doing without any acknowledgement. This is usually the case. Yesterday I put him into his cot for his midday nap, and he insisted on lying on the floor (he's been wanting this quite a lot lately). So I made a little sleep area on the floor and left him to it. 5 minutes later I hear "I want get in bed" said over and over, and when I opened the door he had his khoala under one arm and was pointing up at his cot repeating "I want get in bed". I placed him into his cot and he rolled over, cuddled his beloved khoala and fell asleep immediately. We think his two year molars might be coming through. It has been rough! High temperatures, irritability, zero appetite, constantly waking up throughout the night, and last Friday off from daycare. Jef had the honour this time - I was on a training course. Kien needed lots of cuddles that day, and good thing he had his most favourite person in the world to provide them. I'm looking forward to when Kien is well again and we can spend more family time outside. The week gone has been relatively quiet as I try to find the motivation at work. Coming back from our mini break, with Xmas holidays just around the corner, and my new replacement person trying to pick up all of my work during this handover period I am struggling to find anything interesting to sink my teeth into before the year is out. I'll go back to my regular job in the new year, and I'm looking forward to working on projects again. In the meantime we've got a tree to buy and decorate this morning, some lights to see on Franklin Rd tonight, a bFM Xmas party rock 'n roll extravaganza lined up for Friday, and a birthday celebration on 29th Dec marking TWO years! So I just need to kick back, chill out and enjoy the quietness now. Pics taken a couple of weeks back when we were at Brown St Reserve for a picnic dinner, and at one of the beaches on Marine Parade that I stubbled upon whilst going for a walk with Kien in the buggy. We sailed into Tauranga on the Mount Maunganui side of the harbour on a gray and misty morning. It was raining quite heavily overnight, and everything was slippery and wet on deck. But once we docked the rain eased. We went and had a leisurely brunch (as leisurely as possible given a toddler who wouldn't stay still for longer than 1 minute and we had to take turns chasing him), then decided we would enjoy our time on the boat instead of exploring Tauranga - we can drive to Tauranga any day of the week! So we hang around poolside, Jef enjoying beers and me sipping Beverly Hills iced tea. We had to wait for Kien to decide if indeed he wanted to go swimming. One of his favourite things right now are showers, so you can imagine the joy he had with sitting in the outdoor shower playing with shampoo that made lots of bubbles, and with the water constantly streaming down and tickling him. It was getting way too hot in the sun, so we made our way to the covered pool area on the other side of the ship. There we did some acrobatics. The expressions on his face speaks volumes! We went back to the room and cleaned ourselves up before heading to the Atrium lounge just in time to watch the beginning of a string quartette performance. It was bliss while it lasted, as Kien was fascinated by the music and sat still for a little bit. Then he was off again, and once again we took turns chasing him while the other parent had some quite time. We were up in the Crooners lounge where they specialized in the most delightful array of martinis. Sour apple martini was delicious, and Kien was treated to ice and strawberries. That night Jef was good enough to let me have the night out while he stayed in the room watching our boy sleep. I went to the Vista lounge, where the brass band was playing people were ballroom dancing. It was so much fun to watch spritely couples in their golden years twirling to the swing and the cha cha. Everyone was so good, and I wished I was on the cruise for longer so I could take advantage of their dance classes. I must admit, I can do a passable cha cha, and if I had consumed another cocktail I may have been on the dance floor embarrassing myself all by myself. The following act was a comedian who joked about cruise ships, old folks, marriage and divorce - suitable topics for the evening, I suppose, and even though I found him a little too "middle of the road" he was a hit. I wandered through the casino, and the most interesting of games being played was electronic Texas Hold 'em. There were at least 10 people sitting around the table with individual screens for betting and the main table where all the bets and cards are (electronically). They tap their screens, look at the table, tap their screens some more, and....all over again. It was strange I tell you, no one said a word. I would have observed this for a good 15 minutes while hundreds of dollars were transferred back and forth across the table electronically, but not a word! I wonder what 007 would have made of this game in Casino Royale?!? So all good things must come to an end as we sailed into Auckland harbour yesterday morning. The view from here of The Cloud and Princes Wharf is certainly different. We said goodbye to the boat as we made one last stop into the Crooners lounge on our way out.